"How You Too Can Take Incredible iPhone Photos That Everyone Adores And That You’ll Be Proud To Look At Years Later – Without Ever Carrying A Bulky Camera"
You can access iPhone Photo Academy by login into our course portal. Please click on the “forgot password” link in case you don't remember your password. Alternatively, you can purchase another copy of iPhone Photo Academy using a different email address. That way you’ll purchase another copy that can be used by someone else. Alternatively, you can purchase another copy of iPhone Photo Academy as a gift. You’ll then receive a beautifully crafted gift certificate that you can deliver to the giftee. We could not process this payment. Please pay with your credit card or debit card instead. If you need any help, please send an email to emil@iPhonePhotographySchool.com and we'll get back to you in one business day. Please check if you've entered your credit card details correctly and try again. If you see this message again, please use a different card or your PayPal account. If you don't have any other cards or PayPal, please call your bank and ask them why this transaction was declined. Let them know that our company is based in Latvia, European Union. If you need any help, send an email to emil@iPhonePhotographySchool.com and we'll get back to you in one business day. It looks like there was a technical problem on our servers. Please try submitting your payment again in a few minutes. If you see this message again, please send an email to emil@iPhonePhotographySchool.com and we'll get back to you in one business day. Please pay with your card or PayPal account instead. Please use a different credit card or PayPal instead. Please pay with your credit card instead. And you’re going to discover how you can do the same with your own iPhone photos! I shot and edited these photos with my iPhone… And you too could be taking photos like this with your iPhone not too long from now! And frankly, not too long ago I didn’t know how to take interesting photos myself. The truth is that I was never much of an artist… I couldn’t draw, I couldn’t write poetry, so the traditional art forms were always out of my reach. But I wanted to express myself and develop the creative side of my personality, and that’s why photography has always appealed to me. It’s so rewarding when a photo you take – a photo that didn’t exist just a moment ago – shows other people the unique and beautiful things that you see in the world around you. It could be the amazing places you visit while traveling, the great times you have with your family, or the unique moments that nobody else would be able to enjoy without you taking a photo. And it gets even more rewarding when you can look back at these moments years later when the memories are long gone… And with photos you can experience these memories again. If you’ve been taking photos for a while now, you’ve probably had times when you wish you had your big camera with you, and you’ve probably missed a lot of great photos. And often when that moment is gone, it’s gone forever, and there’s nothing you can do to recreate it. When I got my first iPhone six years ago, I quickly recognized that one of the most essential features of the device was its camera, because for the first time ever, I had a camera that was always in my pocket. Gone were the days when I wished I had my big camera with me. I knew that the iPhone could take great photos… In fact, I saw it every day when I was looking at the photos other people were sharing on Instagram (back then the average photo quality on Instagram was higher because it attracted more serious iPhone photographers). But that didn’t change the harsh reality: the photos that I was taking with my iPhone didn’t live up to my expectations. They were never as good as the photos that my favorite photographers were sharing. They just didn’t look right to me, and I didn’t know what I was doing wrong. Of course, I knew that the iPhone wasn’t as good as high-end DSLRs. And it’s a tool that can be used to take both poor and amazing photos. It was so hard to believe that these photos were taken with the iPhone! In fact, I couldn’t even understand how anyone could take such incredible photos using any camera! And to be frank, it’s not that using the iPhone made their photos that much better. These people simply preferred to use the iPhone because it was the camera they always had with them. Let me put this another way… If you were writing a novel, would getting a new pen make you a better writer? Or should you spend your time improving the content of your novel? And while I knew all of that, I was still struggling to take interesting photos with my iPhone. They just never turned out the way I wanted them to look. I couldn’t look back at them proudly. I knew I was doing something wrong, and I desperately wanted to fix that. I read every iPhone photography book, but most of them were out of date the moment they hit the printing press. That’s because the iPhone camera and the software behind it goes through dramatic changes every year, and the books just can’t keep up with the technology. I bought every iPhone photography course, and unfortunately the same was true for them. Even though Apple has now released iOS 12, you’d be lucky to find a course that’s updated for iOS 9 which came out more than three years ago featuring radically different camera controls. With no other options, I turned to general photography advice, and while some of the concepts covered there were useful, a lot of it was not directly applicable to iPhone photography. Wait, how could I do something like that? You may have heard of this blog… Today it’s read by 1,193,413 people per month. Or they simply didn’t know what they were doing because they were taking photos intuitively. So I also created a photo contest where between 200 and 500 excellent iPhone photos would be submitted every week. My job was to carefully review these photos to select the winners. They don’t just look for scenes that look great in real life, because they know that even the most beautiful views can result in poor photos unless they’re photographed correctly. They take photos from unique angles that most people would never even consider, and when other people see these photos, they don’t understand how it’s possible to take such photos. They don’t just take pretty photos because they look good. Instead they take photos that tell powerful stories and express emotion. Photos they’re proud to look at years later. They don’t take any chances with the camera settings. Instead they take full control of the camera of their iPhone, which allows them to predictably take high-quality photos. They don’t just take a whole bunch of photos hoping that some will turn out great. They already know whether the photo is going to work (and why) before they pick up their iPhone. They see great photo opportunities wherever they go, because they know what to look for. And anyone can become an excellent iPhone photographer by applying these techniques. I know this because after I discovered the exact techniques that the pros are using and started applying them to my own photos, my iPhone photography was never the same again. Taking photos with my iPhone is no longer frustrating. Now it’s fun and rewarding, and the photos that I take with my iPhone are better than the ones I used to take with my DSLR! Thousands of people started following me on Instagram (@iPhonePS), and I started getting compliments for the quality of my iPhone photos… which had never happened before! Some People No Longer Even Believe That My Photos Were Taken With The iPhone! And honestly, I’m not surprised to hear that… because that’s exactly how I felt! I used to think that the best iPhone photographers are naturally talented, and that I would never become a great photographer since I didn’t have this kind of talent. And indeed, some people are born with an eye for taking great photos, but unfortunately I wasn’t one of them. When I started applying the techniques that the pros were using in their photos, people on social media starting telling me that I was a talented photographer, which is something I had never heard before. You don’t have to be talented – you just have to know what you're doing! And for a long time, I didn’t have an easy answer for people like you. You could read boring books, buy outdated iPhone photography courses, interview your favorite iPhone photographers and carefully analyze tens of thousands of photos. And if you can put all the pieces together, your iPhone photos are going to improve over the next six years. In fact, it was so hard that I wanted to create an easier option for people like you who want to greatly improve the quality of their iPhone photos in a fraction of time that I had to spend. iPhone Photo Academy is an in-depth online course that will show you how to take incredible iPhone photos that everyone adores and that you’ll be proud to look at years later. Most iPhone photography courses focus on showing you which buttons to press, and iPhone Photo Academy does that too… While ALSO showing you how to see the world through the eyes of an experienced photographer (which is something most other courses ignore). You see, having the iPhone with you is only half of the equation. The other half is knowing how to use it to take outstanding photos. Some people think that buying expensive gear will make them better photographers, and that’s what camera manufacturers want you to think. But even the most expensive camera won’t make you a better photographer, just like buying an expensive pen won’t make you a better writer. But with the right knowledge the iPhone can be used to take photos that are so good that most people would never even believe that they were taken with a phone! And that’s what you’re going to learn inside iPhone Photo Academy. You’re going to take photos that are so good you’ll be surprised not that they were taken with the iPhone… but that it was YOU who took these photos. You’re never going to run out of interesting things to take photos of, because you’ll know how to recognize amazing photo opportunities wherever you go. And you’re going to have confidence in your iPhone photography. You’ll be taking photos with the iPhone not because you forgot your big camera at home, but because you'll know how to use your iPhone to predictably get high-quality photos every time you press the shutter. Because 59,471 happy students have already completed iPhone Photo Academy and forever changed the way they take photos with their iPhone! And that’s assuming you could find a college course teaching iPhone photography. There are 10 hours of excellent video lessons in iPhone Photo Academy, so those lessons alone would cost you at least $1000 (and that’s excluding $818 worth of free bonuses). So if you want to take incredible photos with your iPhone, now is the time to take action. If you’re not happy with iPhone Photo Academy for any reason, just let me know and I’ll refund your payment. All you have to do is send an email to emil@iPhonePhotographySchool.com and you’ll get all your money back. So you don’t have to make the final decision right now. Just sign up to reserve your spot, see if you like the course, and then make your final decision. "I have learned so many things in this course that it would take a book to write them! It has made looking for photo ops one of my favorite pastimes and taking them a blast! I can't believe how much I didn't know!" In this module you’re going to discover how to take control of your iPhone’s camera, which will help you take perfectly sharp photos every time you press the shutter. We’re going to start with the basics, but even advanced users will discover some hidden tricks in this module. In this module you’re going to discover additional iPhone camera techniques that will help you take full control of your iPhone's camera. While these techniques are relatively simple, they will help you take high-quality iPhone photos that you wouldn’t be able to take otherwise. This is one of the most important parts in the course, because if you don’t follow these timeless principles of great photography, nothing else will even make a difference. So after mastering the technical aspects of the iPhone camera, it’s time to take your iPhone photography to the next level by focusing on these fundamental principles behind all great photography. In Module 5 we’re going to take everything you’ve discovered so far and apply it to some of the most common iPhone photography scenarios. You’re going to get practical advice and step-by-step instructions for taking stunning iPhone photos in any situation you find yourself in. The latest iPhones have advanced camera features that aren’t available on older iPhones. With two separate cameras on the back of the iPhone, you can now easily switch between wide angle and telephoto lenses. The telephoto lens is perfect whenever you need to get closer! Thanks to Portrait Mode, you can now take exceptional portraits with a soft, beautifully blurred background. With Portrait Lighting, you can take well-lit portraits that look like they were taken in a studio. And finally, you can even adjust the background blur of the photos you’ve taken. If you don’t have one of the latest iPhone models (or if your iPhone has only one lens), that’s totally fine. You’ll still be able to take stunning iPhone photos in just a few weeks from now. But if you have one of the latest iPhones, then you’re going to love this bonus module! When you take a photo with Live Photos feature enabled, your iPhone also records a short video just before and after the shot, which allows you to bring your memories to life in a really powerful way. It’s amazing how much emotion can be conveyed in these short videos! Besides playing back these short videos, Apple has just introduced some really creative ways to use your Live Photos. You can now turn your Live Photos into a never-ending video “Loop” or a unique “Bounce” clip, or even convert them into outstanding long exposure photos! When you enroll in the course and your iPhone photography turns into a fulfilling hobby, you’re probably going to experience certain challenges related to managing, sharing and printing your best iPhone photos. If you value your iPhone photography (and your memories), it’s absolutely essential that all your photos are backed up. If you’re not backing up your photos, you could lose your entire photo library and a lifetime of memories tomorrow. This happens more often than you think. And if you don’t preserve the full resolution of your iPhone photos (or if you don’t know how to do that), you won’t be able to print and exhibit your best iPhone photography in the future. When you’re taking photos with your iPhone, you’re sometimes going to make mistakes. Of course, you have the opportunity to learn from your mistakes (if you know how to recognize them) and your iPhone photos will slowly get better once you learn to avoid these mistakes. But what if you could take a MASSIVE shortcut and instead of making all the mistakes yourself you could simply learn from the mistakes of others? I've recorded an in-depth video analysis of 459 iPhone photos where I point out the mistakes these photos make... and how you can improve your own photos by not making these mistakes. These videos will save you hours upon hours of practice... and thousands of ruined photos that you might never have a chance to take again. You'll get the in-depth video analysis of these 459 photos for free when you join iPhone Photo Academy today. This bonus alone has 10 hours of video content that will save you hundreds of hours of practice as you learn from the mistakes made by other photographers. All my students are invited to participate in a private Facebook community where they share their best photos, provide feedback and talk about all things related to iPhone photography. While still being small and cozy, this community is extremely active. On most days dozens of photos and hundreds of comments are posted in this group – all by your fellow students. Unlike other online photography communities, this group is friendly and encouraging, allowing iPhone photographers of all levels to share their best work and get invaluable feedback. There are 6 modules in the course (excluding the free bonus modules). Each module contains between 30 and 90 minutes of video lessons that you can watch at any time that’s convenient for you. Most lessons are between 10 and 15 minutes long, and they’re all available online. Where relevant, the videos feature a live recording of the screen of my iPhone so that you know exactly what I’m doing to create specific effects, which buttons I’m pressing, and how you can do the same on your iPhone. So there will be absolutely no guesswork for you. And in case you ever get stuck, you can ask any questions under each lecture, which will be promptly answered by one of my team members. There are already 12,531 comments! You can follow the course at your own pace and always come back to the videos later when you want to revisit the material or work on improving certain aspects of your iPhone photography. Even if the timing is not right for you, I still encourage you to sign up because the registration won’t open again anytime soon (and when it does, the price will likely be higher). 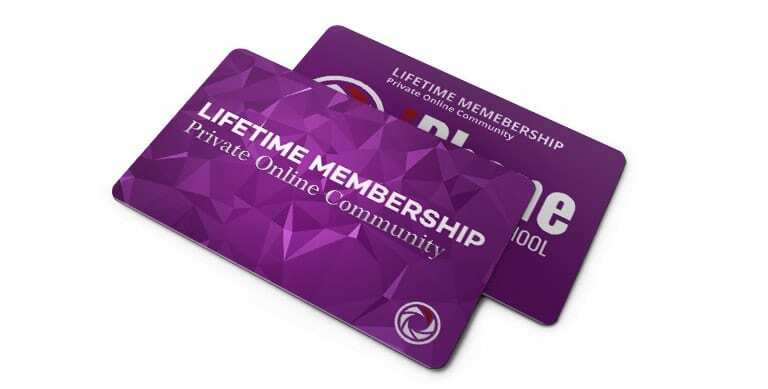 You’ll keep lifetime access to all course content. That means you can always review the material in the future. And you’ll have plenty of time to catch up in case you fall behind. The majority of iPhone Photo Academy students are not good with technology, and even if you feel like you know nothing about technology, you won’t feel left out. All technical concepts are described in simple terms while avoiding unnecessary jargon, which allows people from all age groups to successfully participate in iPhone Photo Academy. And just in case you get stuck, you can always ask any questions under each lecture, which will be promptly answered by one of my team members. There are already 12,531 comments! What if I’m not a good photographer? You don’t need any previous photography experience to join iPhone Photo Academy. All the lectures start from the very beginning while gradually progressing into advanced topics. There are no prerequisites and anyone can learn to take great photos with the iPhone. Even if you think you have no talent or artistic ability, you’ll be able to take outstanding photos by applying the specific techniques that you’re going to discover in iPhone Photo Academy. What if I’m an experienced DSLR photographer? If you’re an experienced DSLR photographer, iPhone Photo Academy is exactly what you need to transition into the world of iPhone photography – and start leaving your DSLR at home! While DSLRs are technically superior to the iPhone, it is now possible to get an unprecedented level of control with your iPhone camera, allowing for a DSLR-like shooting experience, which is why experienced photographers are starting to leave their DSLRs at home more often. Please don’t blame me if you end up selling your DSLR! What if I’m already an experienced iPhone photographer? If you’ve been actively studying iPhone photography for several years, you’re probably going to be familiar with some of the ideas and techniques that are discussed in this course. With that said, even experienced iPhone photographers love the course, because there are so many techniques and ideas that they can apply to make their photos even more interesting. If you’re worried that you might already know everything I teach, I encourage you to sign up, go through the first few modules, and ask for a refund if you’re not learning new things. No matter how much experience you already have, there are always more things to learn! What if I have an older iPhone? Anyone with iPhone 4S or newer will feel at home in iPhone Photo Academy. In fact, many of the photos that you can see on this page were actually shot and edited with iPhone 4S. No, you don’t need to have the latest iPhone to take outstanding photos! While iPhone Photo Academy was designed specifically for iPhone users, a number of students have completed the course using other devices, including iPads and Android smartphones. The principles of great mobile photography are the same on all platforms. Why is there a deadline for registration? Experience has shown that students form a more active community when many people are completing the course at the same time, which helps them further improve their photos. I don’t know when the registration will open again, but it’s probably not going to happen anytime soon because I’ll be busy delivering a world-class experience to my current students. Even if the timing is not perfect, I still recommend that you join the course now since you get lifetime access to all the lectures, and registration won’t open again anytime soon. If you want to request a refund, send an email to emil@iPhonePhotographySchool.com within 30 days of your purchase and you’ll get 100% of your money back, no questions asked. So you don’t have to make the final decision about staying in the course right now. Just sign up to reserve your spot, see if you like the course, and then make your final decision. Of course, I can only afford this guarantee because I know people love my course. And of course, you're also protected by my generous 30-Day Money Back Guarantee. You can choose to pay in installments during checkout. If you select this option, three monthly payments of $39 will be charged.